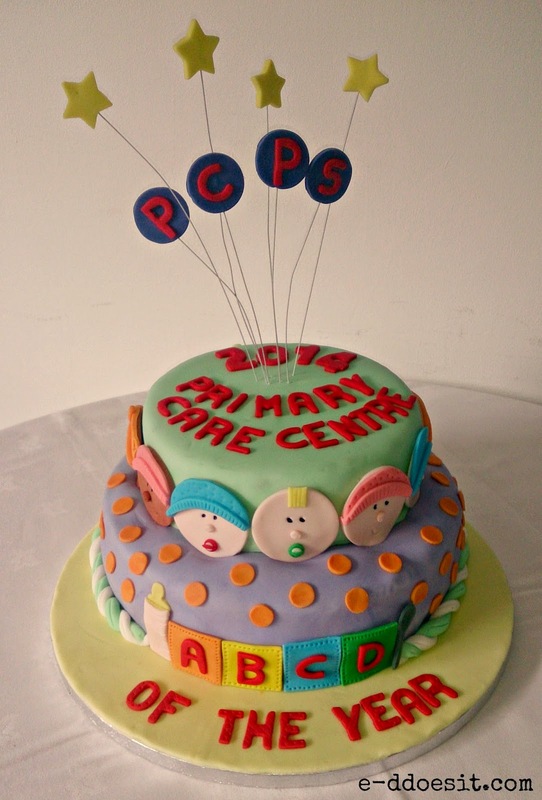 A busy day of celebration in work today, as a special event was held to mark Ballymun being awarded Primary Care Centre of the Year 2014. I don't talk about my real job as a Speech and Language Therapist very often, but obviously I need to work outside my wonderful kitchen in order to keep my fridge and baking press well stocked. I have a fantastic job alongside a wonderful team of dedicated people who have a shared love of working with our clients but also eating my cakes and treats! The award was quite the achievement and lovely for my colleagues and friends alike in work to come together and be commended on the wonderful work they ( or we!) do. I had a request for an aptly themed cake to celebrate the occasion. 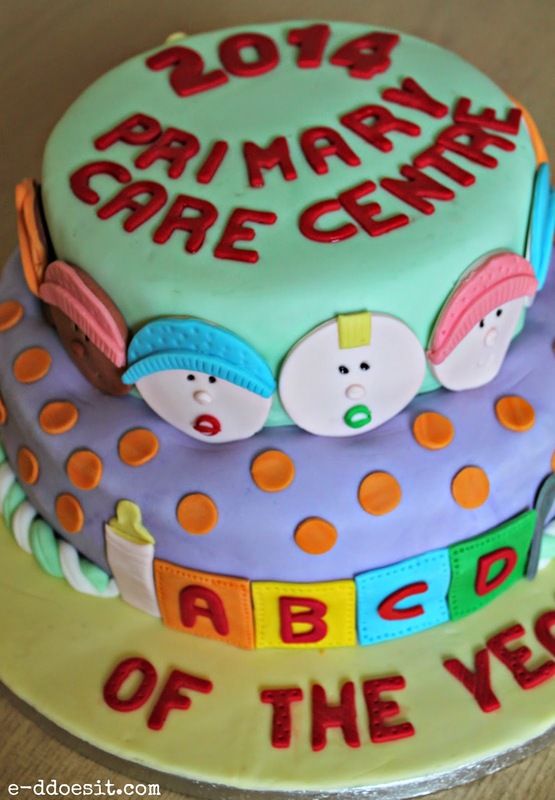 As the award was focussed around the work we do with young babies in the area, a colourful and fun 'baby' themed cake seemed like a fantastic idea. 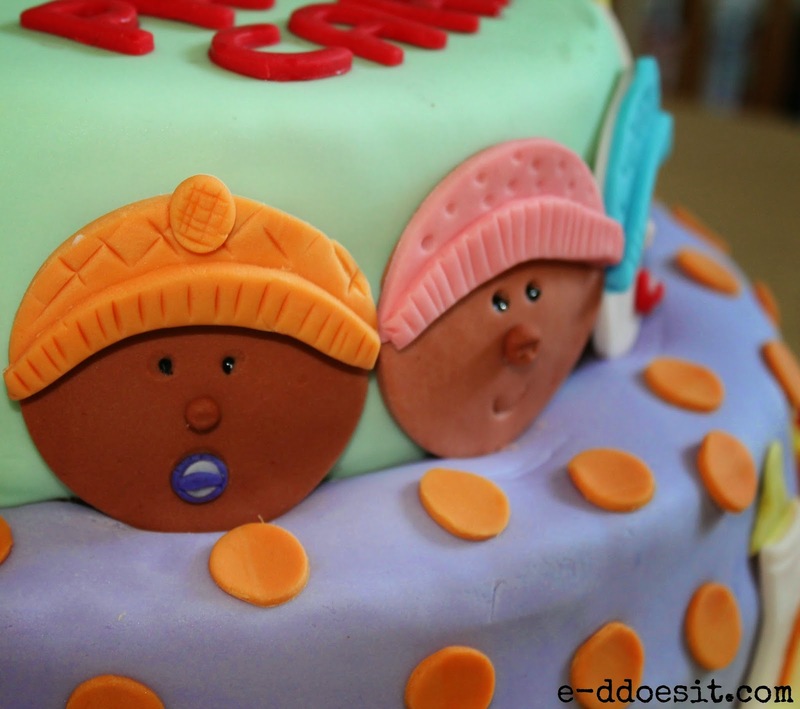 The cake features little baby faces placed around the cake, along with the building blocks A-D which have significance to the programme I work on. The 'starburst' on the top of the cake was a fun and decorative way to give the cake height as well as including the 'PCPS' logo. This cake is an 8 inch cake placed on top of a 10 inch cake and sitting neatly on a 13 inch cake drum. Now it's all great a cake looking well but what's inside I hear you ask? Chocolate, chocolate and more chocolate.This chocolate cake is the perfect solution to a tasty dessert for a Sunday dinner or a party cake for kids and adults alike. Messily iced or pristinely decorated, it's a chocolate cake with the perfect combination of rich and light. What I love about this cake it is very easy to bring together and the recipe is very straightforward and easily doubles or tripled for larger or more adventurous cakes. 1. Preheat oven to 180C and grease and line an 8 inch round cake tin. 2. Cream the butter and sugar until well combined. 3. Make the cocoa powder and water into a paste and add to the butter mixture. appearance and similar to the consistency of a moose. 5. Finally fold in the flour and mix gently until the mixture comes together. 1. Put butter, milk and cocoa in a saucepan and stir over a low heat until the butter is melted. smooth. Allow to cool completely before putting on cake.